We ended up with over 400 CW Qs in the log, but there were only a couple of places where we got a good run. The county line ops were fun, but the long exchange (combined with the compromised screwdriver antenna on my SUV) meant that we were often asked to resend the exchange. If the object were to rack up a score, staying home would have produced more points. But traveling the back roads of southeastern Idaho and northeastern Utah turned out to be a lot of fun! Fair conditions, great operators - a fun QSO party! My eighth 7QP in a row (since 2009). Still one of my very favorite regional contests. Many thanks to the great 7QP stations that made the show so much fun. As usual 7QP conflicts with two family birthday celebrations, so activity was limited. 20 was the money band during the day, though it seemed like 15 was fairly open, just unoccupied. Nice to be called by a few Europeans! Lots of QRN made the low bands difficult at night, requiring more fills than usual. Still, all-in-all my best score for 7QP (OK, using the amp helped a bit). There were some interesting conditions this weekend. Yesterday was a toss-up between working the multi-contest and getting on 6 Meters for the Sporadic E opening. At one point, I got to do both as there were some WY stations on USB that I also worked on FM simplex. A major frustration for me was stations from outside the QSO Party areas calling CQ with no indication that they weren't working all comers. 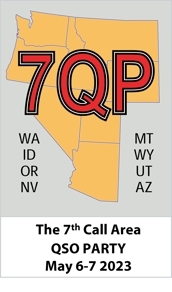 Nowadays, with many stations having calls that don't reflect their locations, if you're going to call into the QSO Party Areas, add your state to your call (e.g., NC6K/CA) so out-of-area stations know that you aren't worth any points. Operating as a marine station anchored in/near Port Gardner Bay, WA aboard the 39' sloop 'Mistress II'. All contacts made at 9 watts using backstay antenna with saltwater counterpoise and were powered by the vessel's 12v battery system with engine not running. Earlier contacts made from location near Mukilteo WA (Snohomish County), and later contacts made from location near Camano Head, the southern tip of Camano Island, WA (Island County). TNX for the contest, it was fun. I particularly want to thank those CW operators who were willing to slow down (or space out high speed characters). They really helped to make the contest more fun, for us lower speed CW ops. Nice to see some PSK31 participation. Need more in future QPs. Slim pickin's this year on RTTY! Great fun in the middle of the desert for my first 7QP. Winds gusting to 35 mph mandated I duct tape the laptop to the table. See you next year! N7N was a three-man expedition to seven remote and sparsely populated counties in NV. We operated portable from four locations, two of which were on county lines, from W6GJB's two-station trailer, and mobile from W6GJB's pickup between those locations. A fifth county-line site was planned, but recent rain had turned the road to a sea of squishy mud. As a result, operation from NYE and LAN was mobile only. Each of the two portable stations consisted of a K3 with P3, KPA500, and KAT500, using a C3SS for 20M, a 40M dipole at about 40 ft, and an 80M inv Vee with apex at about 30 ft. The mobile rig was a KX3 with KXPA100 with 20M and 40M Hamsticks. W6JTI and K9YC did most of the operating, W6GJB drove the truck towing the trailer, and designed and built the really nice trailer that made the trip possible. See pics and stats here (warning to mobile viewers: 17 MB PDF file follows! ).